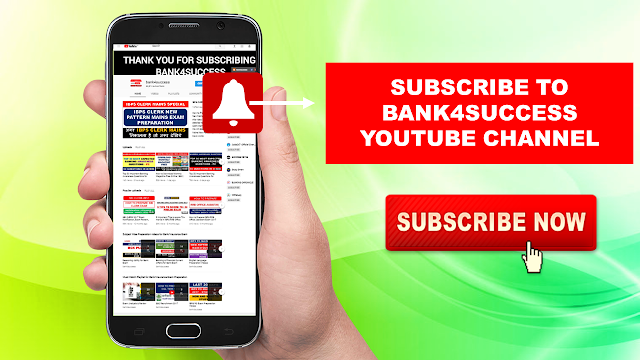 How to Attempt Reasoning Ability Section in IBPS, SBI, RBI, LIC and Other Bank Exam.Reasoning Ability in Bank Exam consists of easy, moderate and difficult level of questions. 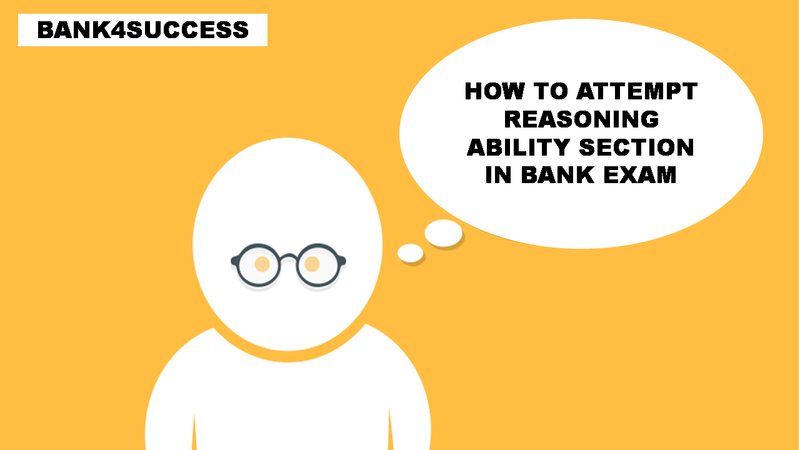 Reasoning Ability Tips and Tricks for Bank Exam. 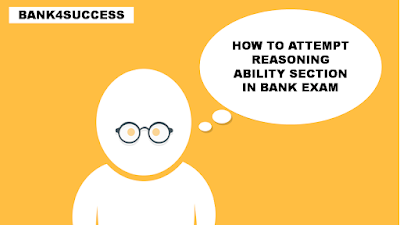 Reasoning Ability in Bank Exam is considered to be most scoring section in exam as it comes with the set of questions like you get a puzzle which has 5-6 Questions,Similarly with the Questions asked from Coding Decoding,Syllogism, Blood Relation and Inequality in Bank PO and Clerk Exam. Reasoning Ability in Bank Exam basically tests your brain power. Reasoning Ability in Bank Exam consists of easy, moderate and difficult level of questions. The basic need is that you must know how to differentiate between tough and easy questions and which ones to attempt first. You need to be very careful about question selection in this section. Today we are sharing you the Detail about how to attempt the reasoning section in bank exam because reasoning is considered to be one of most scoring section but only when you attempt the question in right way. Syllogism :- In this section questions can be asked in two ways like normal syllogism and another is Syllogism with Possibilities. Both the type of Syllogism can be solved through Venn diagram and also from Vowel Rule like (A+A=A), you just need to solve through any method. Conclusions: Some actors are dancers. No singer is actor. Coding Decoding: - In this also question can be asked in many ways like syllogism. See the below example to get idea. (1) £ ? • $ @ ? (2) @ ? * $ @ ? (3) £ ? * $ @ ? If in a certain code language, ‘851’ means ‘good sweet fruit’; ‘783’ means ‘good red rose’ and 341 means ‘rose and fruit’ which of the following digits stands for “sweet” in that language? Inequality: It also comes in a set of 5 questions and there can be different type of questions based on the level of exam. v) A + B means A is smaller than B. Blood Relation: This question can be solved in 20-30 min if you know right technique and you have done some practice. If A + B means A is the mother of B; A - B means A is the brother B; A % B means A is the father of B and A x B means A is the sister of B, which of the following shows that P is the maternal uncle of Q? Direction Sense Test : This question is based on the direction covered by a particular object and based on that you need to answer the various type of question which asked on this topic. It is also considered as easy topic but to make it complicated they give you this question in data sufficiency where you may need to find the two- three direction which can be lengthy and time consuming. Q.A man walks 5 km toward south and then turns to the right. After walking 3 km he turns to the left and walks 5 km. Now in which direction is he from the starting point. A # B means B is at 1 meter to the right of A. A $ B means B is at 1 meter to the North of A. A * B means B is at 1 meter to the left of A. A @ B means B is at 1 meter to the south of A.
I. Point Z is at equal distance from both point X and point Y.
II. Walking 5 km to the East of point X and taking two consecutive right turns after walking 5 km before each turns lead to point Y. Machine Input Output : In this question you will get some random generated Input which will have numbers and words, and below that there will be some steps to get that input arranged in some specific order and after that there will be output which will again have random number and word and you have to arrange that output based on the logic of Input arrangement provide with Steps. After arrangement you will have answer a set of 5-6 Questions based on your arrangement. Will Provide Remaining PDF and Books Soon..